Capacity - 8 cup type BB 5,5 mm. Barrel length - 600 mm. Stock and Lodge - black synthetics. Overall length - 1040 mm. Effect of trigger - single. The Walther 1250 Dominator implements the proven engineering of the successful Walther LG300 Dominator in a compressed air repeating system with 8-shot rotary clip. The loading bolt action feeds the pellet directly into the barrel resulting in precise long distance shooting with minimal velocity reduction. The 300 bar air cylinder allows a shooting capacity of 100 shots with 40 Joules. The fibre glass reinforced stock with two sided Monte Carlo cheekpiece is equally suited for right and left handed shooters. Pistol grip and forearm knobs grant a tight grip for the shooter in every firing position. 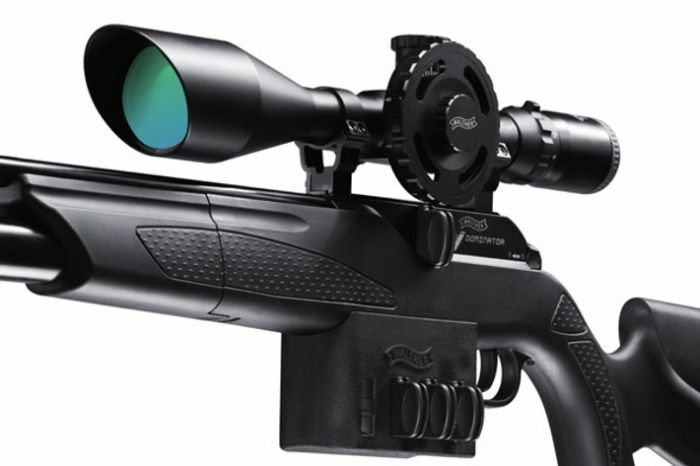 Field Target Model - includes Walther FT rifle scope 8-32 x 56, bipod TMB II and silencer.